Nathan debuted for Adelaide in 2004 and went to play 113 games for the Crows including a stellar 2008 season which included selection in the all Australian team. Nathan was recruited to the Gold Coast SUNS in 2011 and played a respectable 27 games before a horrific leg injury ended his AFL playing career. 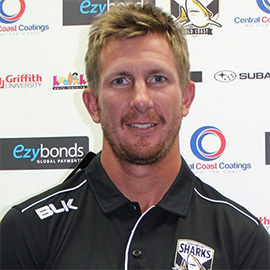 Joining the Southport Sharks in 2015, Nathan was successful in coaching the team to an elimination final that season. Nathan went on to coach a further two seasons at the Sharks. The club understands Nathan’s decision as he considers alternative options for his future. Nathan is an AFL level two accredited coach and is looking to use his experience within the football industry. Southport Sharks wish Nathan all the best for the future and would like to thank him for his three years at the club.